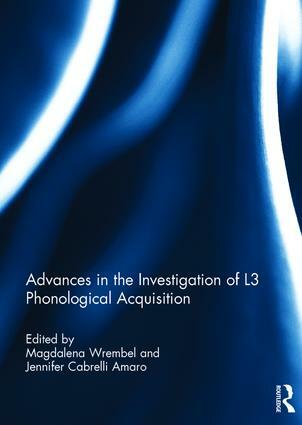 This book aims to bridge the gap in investigations into the acquisition of phonology from a multilingual perspective. In order to fully understand this process, the editors present state of the art research into third language (L3) phonology as well as future considerations for this field. The individual contributions address limitations apparent in current literature, in terms of methodology and scope, while offering innovative solutions in the study of conceptualization, design and data analysis, and novel application of theoretical frameworks to L3 phonology. The contributions consist of a number of original studies which attempt to address vital research questions regarding a bilingual advantage for subsequent phonological acquisition, the variables that drive phonological transfer at the onset of third language acquisition, the L3 developmental path, and how L3 phonological acquisition affects existing systems. The empirical and theoretical strides made in the study of L3 phonology, provided in this volume, confirm that it is a promising area of inquiry with a growing potential to provide novel insights into the linguistic and cognitive underpinnings of language acquisition. This book was originally published as a special issue of International Journal of Multilingualism. Magdalena Wrembel is a Professor and Head of Studies at the Faculty of English, Adam Mickiewicz University in Poznan, Poland. Her main research areas involve SLA of speech, phonological acquisition of the third language, multilingualism, language awareness as well as innovative trends in pronunciation pedagogy. Jennifer Cabrelli Amaro is an Assistant Professor of Spanish Linguistics in the Department of Hispanic and Italian Studies and director of the Multilingual Phonology Lab at the University of Illinois at Chicago, USA. Her research centers on adult acquisition and attrition of phonology, and current work focuses on longitudinal development of phonology and morphosyntax in third language acquisition.